One of the most moving stories of my entire medical career was a woman called Susan (her real name). She was 39 years old when she came to me. Her parents had read about me in the newspapers, talking about improvements despite brain damage, and wondered if I could help their daughter in any way. Susan was indisputably mentally handicapped and had the mind of a child. She could not read or write; she could not count or deal with money; she was a danger to herself in the kitchen, since she was extremely clumsy and forgetful - the sort of individual who might overlook lighting the gas and blow herself up, or forget that dishes from the oven are very hot and could cause serious burns. She couldn't even be allowed to cross the road unaccompanied, for fear of her safety. But that was all about to change. Just a few weeks into my Food Allergy Plan, Susan "woke up." In her own dramatic and moving words, she said "I just woke up one day and I was here!" I find it hard to comprehend what that must mean for a woman of almost 40, whose life had been uncomprehending up to that point. Not that she settled for moping about the lost years. Susan began learning to read and write; she could count; she could go shopping on her own; she understood money and could obtain the correct change; she wanted to paint and live life to the full. "This morning I tied my own shoelaces - tied them into neat little bows. And I did it all on my own - without any help from Mum or Dad." You probably think that's no great achievement for a 39-year old woman but, believe me, it's a very big step and I feel terribly proud. "You see for most of my life I have been classed as 'mentally handicapped' and even the simplest tasks were well beyond me. Although I could see, hear, smell, taste—I simply couldn't understand what my senses were telling me. The messages were all jumbled. So the world passed me by in a confused, bewildering blur. It's only in the last few months I've come out into the real world - and it's fantastic. I feel as if I've been reborn or, at least, released from prison after serving a long harsh sentence." I could tell even the hard-nosed journalists were really gripped by this drama. Susan's allergies, when we had discovered them, were beef, dairy products, wheat and tomatoes. Of course she had been fed dairy products from birth and in any case had met all four foods in the womb. Susan was born off-center because food reactions developed before she even drew her first breath. In Susan's case the target organ was her brain. Here was a salutary case where over 95% recovery of brain function took place. Let it be a solemn warning to all, what sad stories may be out there, of people doomed to inadequacy because of unsuspected reactions to humble everyday foods. Long afterwards I used to love getting the scrawly letters Susan wrote me. Possibly the deepest moment of all between us was when, on her final visit, she asked if she could work for me and help others in a similar predicament to hers: "I can answer the phone and write things down!" she said proudly. It takes a lot to render me speechless, as friends and family will confirm, but at that moment the lump in my throat was so big I couldn't answer. I just trusted to a hug. This is just one of many cases in my career in which I have been able to transform an individual's life through natural medical advice and treatment. I consider Dr Keith Scott-Mumby to be unmatched in terms of his vast knowledge and diversity of experience. Unlike most MDs he fully embraces alternative medicine and advanced personal development psychology. During the 1980s he almost single-handedly changed public appreciation in the UK of the way in which food and environmental allergies make us ill. The case history above is just one example. His new book is called "Diet Wise." Its theme is letting your own body choose the food that's right for you. Forget the Atkins diet, the metabolic typing diet, the South Beach Diet and all the rest - every popular diet ever conceived has made many individuals ill, because they have an allergy or genetic incompatibility with one or more of the recommended foods. The right way to go is to figure out your own unique diet and he shows us how to do just that. Genetic food incompatibility is a budding new science. 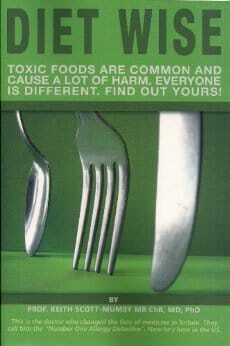 Make no mistake - food can make you sick. Perhaps very sick. Foods can also help you switch off "bad" genes and will nurture "good" genes. So it is vitally important what you eat. The trouble is, you don't know which foods, do you? Well, now there is a book which will help you figure it out for yourself. Dr Scott-Mumby puts together the benefits of his vast clinical experience to show you how you can uncover the secret foods that may be sapping your vitality, reducing your mental powers, causing numerous mysterious symptoms and perhaps even shortening your life. You can feel great, shed pounds, look and feel terrific, all the while eating as much healthy food as you like. In fact food cravings will vanish and weight control is almost automatic, once you follow the steps laid out for you. Here are universal healthy eating principles that nobody should be ignorant of. If you eat right you will feel great and naturally lose weight. His explanations are enriched by many fascinating and moving case histories, showing how some individuals overcame almost impossible odds to eventually find health and happiness, using the diet steps in this book. It will work for you too. The Diet Wise Academy is your route to an amazing new life of vitality and it's a journey which everyone should do, at least once in his or her life. It sets you up for a future of abundant health. There is no question that what you eat is the single most powerful influence on your future health: even the fakes and phoneys agree that. Real practitioners of health... doctors, osteopaths, chiropracters, naturopaths, nutritionists, dentists, etc.... everyone knows it's true. My beloved second wife Vivien cured a brain tumor (pituitary) using only diet, nutritional supplements and spiritual healing. This was before she met me (indeed, this was why she met me). But I've done it many, many times with sick people and the formula is always the same: find out what YOUR body likes best. Forget all the standard set diets; they only work for a few. The real diet you are looking for is your personal best diet plan. Nature knows what it is; religious enthusiasts might say that God knows what it is; but your body sure as Hell knows what it is. And I know the language; I know how to talk to your body in ways that it will reveal its ultimate secrets. I can teach you how to talk to your body and the Diet Wise Academy is growing to be the summation of all I learned over nearly 40 years of research and enquiry. Become a member and you'll learn the real secrets of feeding your body the rocket fuel that will take it... healthy and well... into your next 100 years of living. I recommend you at least sign up to get the intro videos, which offer tons of good information in their own right. Dr. Keith explains exactly what you get in the Diet Wise Academy and, more importantly, why you should do it. Dr. Keith's knowledge will get you straight on lowering inflammation, clearing your brain and rejuvenating your tissues. It's the most important health invnestment you can make in your entire life: your passport to trouble-free years, lots of vitality and an extended life. Echoing the words in the first video you saw: If you don't leap out of bed every day with a wild abundance of energy, brain sparkling bright, on fire with enthusiasm, looking a decade or more younger than you really are... then you NEED the Diet Wise Academy!